The figures below, by numbers and by aggregate weight, are best estimates rather than exact figures. Because the Civil Defence records were destroyed during the bombing, separate figures of the bombs that fell in the first and second raids were lost, and a total figure for the first night is all that is available. 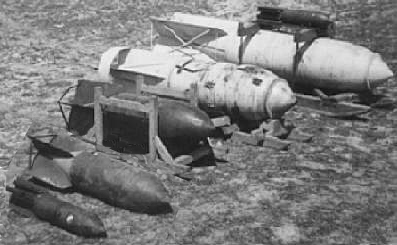 Most of the attacking planes could carry 250Kg bombs, and adaptors were available to mount four 50KG bombs in the space where one 250Kg bomb could be carried. The larger planes could carry several 500Kg bombs or two 1000Kg bombs or one 1800Kg bomb. These weights were of the complete bomb. The explosive charge inside the bomb was typically just under half (47% on average) of the overall weight of the bomb. 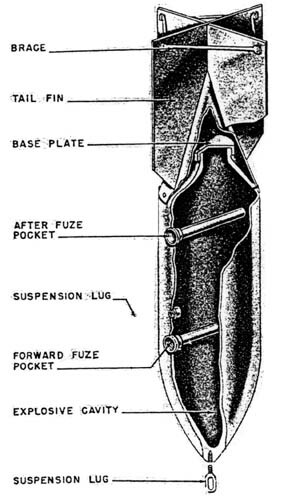 Apart from the Incendiary, which was made of magnesium so that it burned with a fierce heat, the bombs were all made of a thin steel case containing an explosive mixture of chemicals and a detonator (or FUZE in the diagram). These were designed to be dropped on land, and would create a lot of blast damage. The same explosive mixture in different shapes and thicknesses of case made other types of bomb designed to penetrate armoured steel (for use against tanks), concrete (for use against defensive positions) or water (for use against ships and submarines). None of these variants were dropped on Bath. The bomb in the diagram is the 250Kg bomb, but all were of very similar construction. The suspension lug was for lifting and manoeuvring, and it could be screwed into the nose or the balance point on the side of the casing depending on the equipment used to lift it. This picture below gives the relative sizes of the bombs. From front to back are the 50Kg, the 250Kg, the 500Kg (in the wooden frame), the 1000Kg (nicknamed by the Germans "Hermann") and the 1800Kg (nicknamed by the Germans "Satan"). The bomb right at the back appears to be a 50Kg variant. The incendiary, which is not included in the picture, was a third of the length and a quarter of the diameter of the 50Kg bomb.